Lundin Gold Announces Us$400 Million Private Placement | Lundin Gold Inc.
VANCOUVER, BRITISH COLUMBIA--(Marketwired - Feb. 25, 2018) - Lundin Gold Inc. ("Lundin Gold" or the "Company") (TSX:LUG)(OMX:LUG) is pleased to announce a US$400 million equity private placement financing (the "Private Placement"). The Private Placement, coupled with the recent lenders' commitments for a senior debt facility, substantially completes the funding requirements, based on current estimates, for the Fruta del Norte gold project in Ecuador ("Fruta del Norte" or the "Project"). Subscribers to the Private Placement include Newcrest Mining Limited ("Newcrest"), Orion Mine Finance Group ("Orion"), and Zebra Holdings and Investments S.à.r.l. and Lorito Holdings S.à.r.l. (the "Lundin Family Trusts") at a weighted average subscription price of CAD$5.44 per common share. This is equivalent to a 13% premium to the February 23, 2018 closing price of CAD$4.81. The Company will be issuing an aggregate of 93,497,140 common shares pursuant to the Private Placement, which represents 78.1% of its current issued and outstanding shares. Newcrest will be subject to certain standstill restrictions. "Newcrest has extensive experience building gold mines and bringing them into production. As our strategic partner, their knowledge and expertise will be valuable as we develop Fruta del Norte into a large, high-grade gold mine," said Ron Hochstein, President and CEO of Lundin Gold. "With the support of Newcrest, Orion, the Lundin Family Trusts, and the recently announced senior debt facility, our team can now focus on driving the development of this Project to its goal of first production by the end of 2019, on schedule and on budget." The Private Placement is expected to close on or before March 31, 2018 and is subject to regulatory and other customary approvals, including TSX approval and the filing of a listing prospectus with the Swedish Financial Supervisory Authority. The Private Placement, if completed, will materially affect control of the Company (as determined in accordance with the TSX Company Manual) since Newcrest, at the closing of the Private Placement, will hold greater than 20% of the issued and outstanding shares and will become the largest shareholder of the Company, and therefore requires Shareholder approval under section 604(a) of the TSX Company Manual. The Company has obtained such approval through the solicitation of written consents in a form acceptable to the TSX as permitted under section 604(d) of the TSX Company Manual. The threshold for approval by way of consent is approval by beneficial shareholders owning, in the aggregate, more than 50% of the outstanding shares. Lundin Gold and Newcrest have also signed a binding heads of agreement to form a joint venture company to explore eight early stage concessions held by Lundin Gold. These concessions are to the north and south of Fruta del Norte and exclude the large block of concessions surrounding the Fruta del Norte deposit (see Figure 1). Newcrest can earn up to a 50% interest in the joint venture company by spending US$20 million over a five year period. Under the earn-in, Newcrest is committed to spend a minimum of US$4 million over the next two years and has the option to spend a further US$6 million over the following 18-month period to earn an initial 25% interest. By spending an additional US$10 million within the five year period, Newcrest can earn a further 25% interest. Newcrest will be the operator of the joint venture. Lundin Gold has engaged BMO Nesbitt Burns Inc., GMP Securities L.P., and Scotia Capital Inc. as financial advisors for this transaction. Blakes, Cassels and Graydon L.L.P. acted as legal counsel to the Company. A conference call and webcast will be held on Monday February 26, 2018 at 7:00 a.m. EST or 13:00 CET to discuss the Company's news. Please call in 10 minutes before the conference call starts and stay on the line (an operator will be available to assist you). A replay of the webcast will be available via the above link approximately two hours after the completion of the conference call until 11:59 pm EST on March 12, 2018. 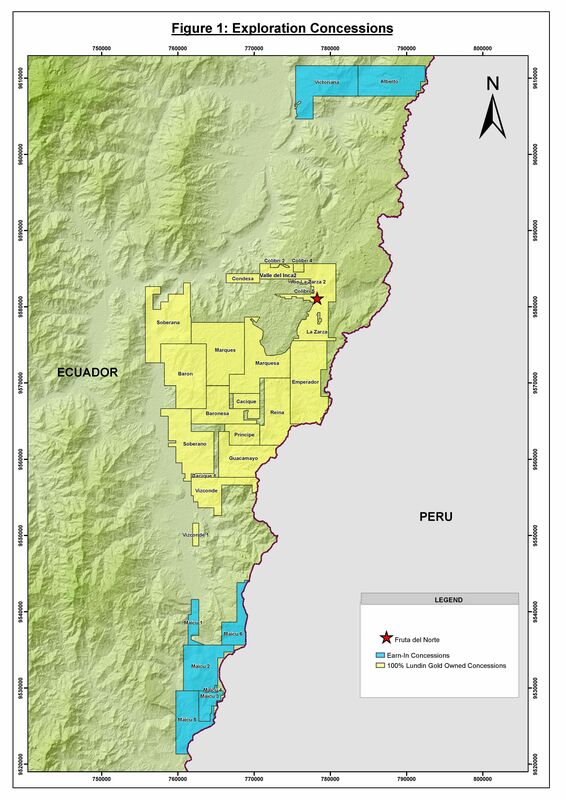 Lundin Gold, headquartered in Vancouver, Canada, is developing its wholly-owned Fruta del Norte gold project in southeast Ecuador. Fruta del Norte is one of the highest-grade and largest gold projects currently under construction. The Company's board and management team have extensive expertise in mine construction and operations and are dedicated to advancing this project through to first gold production in 2019. The Company operates with transparency and in accordance with international best practices. Lundin Gold is committed to delivering value to its shareholders, while simultaneously providing economic and social benefits to impacted communities, fostering a healthy and safe workplace and minimizing the environmental impact. The Company believes that the value created through the development of Fruta del Norte will benefit its shareholders, the Government and the people of Ecuador. The information in this release is subject to the disclosure requirements of Lundin Gold under the EU Market Abuse Regulation and the Swedish Securities Markets Act. This information was publicly communicated at 1:30 pm Pacific Time on February, 25 2018. Certain of the information and statements in this press release are considered "forward-looking information" or "forward-looking statements" as those terms are defined under Canadian securities laws (collectively referred to as "forward-looking statements"). Any statements that express or involve discussions with respect to predictions, expectations, beliefs, plans, projections, objectives, assumptions or future events or performance (often, but not always, identified by words or phrases such as "believes", "anticipates", "expects", "is expected", "scheduled", "estimates", "pending", "intends", "plans", "forecasts", "targets", or "hopes", or variations of such words and phrases or statements that certain actions, events or results "may", "could", "would", "will", "should" "might", "will be taken", or "occur" and similar expressions) are not statements of historical fact and may be forward-looking statements. By their nature, forward-looking statements and information involve assumptions, inherent risks and uncertainties, many of which are difficult to predict, and are usually beyond the control of management, that could cause actual results to be materially different from those expressed by these forward-looking statements and information. Lundin Gold believes that the expectations reflected in this forward-looking information are reasonable, but no assurance can be given that these expectations will prove to be correct. Forward-looking information should not be unduly relied upon. This information speaks only as of the date of this press release, and the Company will not necessarily update this information, unless required to do so by securities laws. This press release contains forward-looking information in a number of places, such as in statements pertaining to the completion of the Private Placement and the use of proceeds of the Private Placement, the adequacy of the Company's financing, the timing of first production, the completion of the earn-in by Newcrest and the formation of the joint venture, the progress of the development, construction and operation of the Project and the timing and success of permitting and regulatory approvals. Factors that could cause actual results to differ materially from the Company's expectations include, but are not limited to: risks relating to receipt of regulatory approvals; risks that the conditions to the completion of the Private Placement will not be satisfied or waived; the ability to arrange financing and the risk to shareholders of dilution from future equity financings; the ability to maintain its obligations under its current project financing and other debt; risks related to carrying on business in Ecuador; volatility in the price of gold; the timely receipt of regulatory approvals, permits and licenses; risks associated with the performance of the Company's contractors; risks inherent in the development of an underground mine; deficient or vulnerable title to mining concessions and surface rights; shortages of critical resources, labour and key executive personnel, such as input commodities, equipment and skilled labour, and the dependence on key personnel; risks associated with the Company's community relationships; unreliable infrastructure; volatility in the market price of the Company's shares; uncertainty with the tax regime in Ecuador; measures required to protect endangered species; the cost of compliance or failure to comply with applicable laws; exploration and development risks; the accuracy of the Mineral Reserve and Resource estimates for the Fruta del Norte Project and the Company's reliance on one project; risks related to artisanal and illegal mining; uncertainty as to reclamation and decommissioning; risks associated with the Company's information systems; competition in the mining industry; the ability to obtain adequate insurance; risks of bribery or corruption; the potential for litigation; limits of disclosure and internal controls; and the potential influence of the Company's largest shareholders. There can be no assurance that such statements will prove to be accurate, as Lundin Gold's actual results and future events could differ materially from those anticipated in this forward-looking information as a result of the factors discussed in the "Risk Factors" section in Lundin Gold's Management Discussion & Analysis for the financial year ended December 2017.